Original Droid owners, prepare yourselves for an update! No it’s not Gingerbread, but it is Android version FRG83D (updated) which likely just means 2.2.1 like we’ve seen on the Nexus One. From the sheet above you can see that the update looks pretty minor and is mostly a bug fixer with added 2010 Exchange support, but does include a “new Gmail user interface” which sounds interesting enough. So when should you all expect to see it on your handsets? 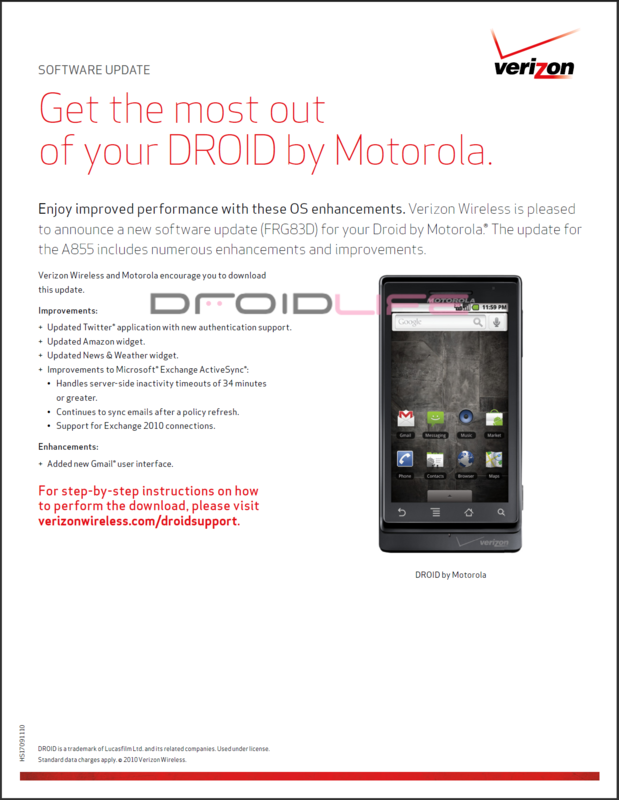 A few of our readers just sent over an email that they received as a part of the Motorola Feedback Network detailing information about an original Droid software update that will be sent out over the next 24 hours. We’re assuming it’s the same one that Verizon is expecting. Over the next 24 hours, barring last-minute changes, we will begin to distribute the latest Droid software to a select group of owners, and you should expect to be among them. * As a Motorola Feedback Network member, you are key to this test. Some of the owners are chosen at random and as a result, we won’t get feedback from them. But we’re counting on you and other members to provide us with a quick and accurate assessment of this update. After this pre-launch release, we’ll observe for a few days to make sure all is well, before releasing to all owners. And we told you all about this Motorola Feedback Network just last week, so if you didn’t join it and get this email, that’s your own fault! Kidding of course. We’ll keep you updated as we have more! Cheers E, M and J!